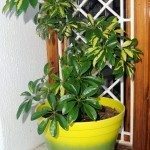 Is my schefflera a dehumidifier? I have a mystery. When my grandmother passed, I inherited a dwarf schefflera from her funeral. I am the only person to water the plant and have gone so far as to ask my family if they have come over and watered the plant but they swear they have not. I have purposely let months pass without watering the plant but it's container keeps filling up with water. It's not near a water source. There are no leaks that could be dripping into the plant. All the nearby windows are new and have tight seals and are always closed. I am mystified. Can this type of plant pull moisture out of the air like this? It's so severe the leaves are yellowing and falling off! 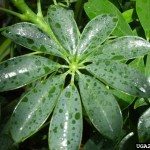 I have not found any information regarding the plant 'pulling moisture from the air', but it certainly is a plant that is know for it's abilities to remove pollutants from the air.